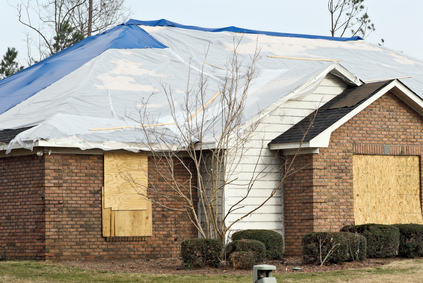 When your property is damaged, temporary repairs or solutions may be necessary to protect your property from further damage and to protect the building’s occupants while repairs are being made. At Hudson Valley Contracting & DKI, we offer various temporary services throughout the restoration process. Water, fire, and other types of property damage can result in your property being exposed and vulnerable to additional damages or losses. Emergency board up services secures windows, doors, and other openings to prevent unwanted entry into your property and protects your property from rain, snow, and wind. If your roof is damaged, your property may be vulnerable to water damage or damage caused by animals or birds that can enter your attic space through an opening. We offer temporary roof tarping services to secure your roof until permanent repairs can be made. We provide emergency 24/7 board up and tarping services to ensure your property is secure as quickly as possible, limiting the damage to your property. Call now! While repairs are being made to a portion of your property, things can get a bit messy. At Hudson Valley Contracting & DKI, we utilized advanced containment methods to limit exposure to construction dust, mold spores, or potentially hazardous asbestos or lead particles resulting from demolition. This keeps areas outside the construction area cleaner, and eliminates the risk of contaminating other areas of the property. We may also utilize negative air pressure and air scrubbing techniques to remove potentially hazardous particles from the air and to prevent them from travelling to unaffected areas of the property. By utilizing negative air pressure, dust is pulled into the containment area and is either trapped in an air filter, or safely exhausted outside. Hudson Valley Contracting & DKI Claims Specialists are available 24 hours a day, 365 days a year.